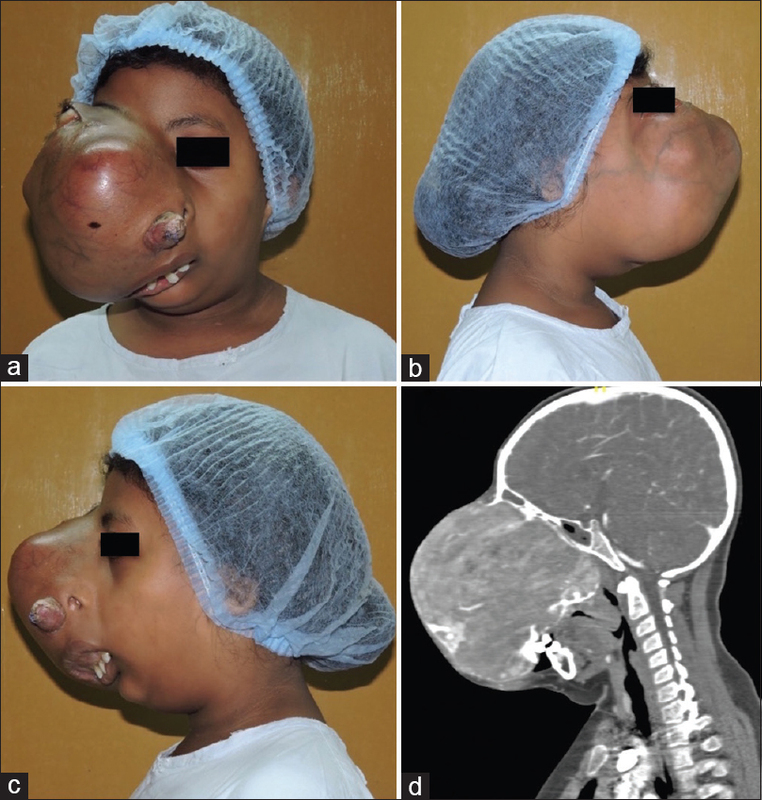 Fibrous dysplasia of the maxilla is a benign condition which presents as gross facial deformity and poses great airway-related challenges to anaesthesiologists. The primary concern is the management of anticipated difficult airway, particularly difficult mask ventilation. Careful planning and an individualised approach are needed for airway management of such cases, especially in paediatric patients. Herewith, we report the successful anaesthetic management of a case of huge fibrous dysplasia of the maxilla in a paediatric patient with the use of ProSeal™ laryngeal mask airway (LMA) and C-MAC® videolaryngoscope. A 12-year-old girl weighing 32 kg presented with progressively increasing huge swelling on the right cheek for the past 4 years. She also had a history of decreased vision in the right eye along with difficult nasal breathing. She had no other comorbidities. On examination, the swelling involved the right side of the face extending from the upper right eyebrow to angle of the mandible and from left nasolabial fold to right zygomatic arch [Figure 1]a. Proptosis of the right eye [Figure 1]b along with obliteration of nasal cavity was also seen [Figure 1]c. Systemic examination was unremarkable. Airway examination showed Mallampati Class II with 2-cm mouth opening. Routine investigations were within normal limits. Contrast-enhanced computed tomography showed a 13 cm × 12 cm × 11 cm expansile lytic lesion with hyperdense areas involving maxilla and ethmoid [Figure 1]d. Telelaryngoscopy revealed normal vocal cords without any deviation. She was diagnosed as a case of fibrous dysplasia of maxilla and posted for excision under general anaesthesia. On the day prior to surgery, embolisation of bilateral internal maxillary arteries was done to reduce the vascularity of the tumour. Consent was taken for tracheostomy and the patient was premedicated with diazepam 2.5 mg, famotidine 10 mg and metoclopramide 5 mg orally on the morning of surgery. In the operating room, a difficult airway cart was kept ready with ProSeal™ LMA, videolaryngoscopes and tracheostomy kit. The transtracheal jet ventilator was kept ready as a rescue airway technique. After attaching all standard monitors, baseline parameters were recorded and intravenous access was secured. Preoxygenation without a complete seal was done for 5 min and anaesthesia was induced with fentanyl 70 μg and propofol 70 mg intravenously. As soon as the patient became unresponsive, a ProSeal™ LMA of size 2.5 was inserted. After confirming adequate ventilation, the patient was started on sevoflurane and paralysed with intravenous succinylcholine 50 mg. After 1 min of adequate ventilation with oxygen, the ProSeal™ LMA was removed and intubation was attempted with C-MAC® videolaryngoscope with Macintosh blade. A Grade 2 Cormack and Lehane was achieved, and a styleted 6.0-mm ID flexometallic tracheal tube was inserted into the trachea under vision. Endotracheal tube position was confirmed by bilateral air entry and capnography. The left radial artery was cannulated for invasive blood pressure monitoring and two large-bore intravenous cannulae were secured. Complete excision of the mass was done, and the entire intraoperative period remained uneventful with stable haemodynamics. At the end of surgery, the patient was extubated on table when fully awake and shifted to postoperative ward for monitoring. We were able to accomplish intubation in a paediatric patient with impossible mask ventilation due to fibrous dysplasia of maxilla by using ProSeal™ LMA and C-MAC® videolaryngoscope. The prime concern in the airway management of our case was difficult mask ventilation because of the gross facial deformity. Although awake fibreoptic bronchoscopy is often regarded as a technique of choice for tracheal intubation in patients with known airway difficulty, it may not be of much help in a subset of patients such as paediatric and uncooperative patients. In paediatric patients, options for difficult airway management are restricted and an approach that might not be regarded as a primary approach in an adult co-operative patient is required. One such option is attempting intubation after induction of general anaesthesia. Although inhalational induction while preserving spontaneous ventilation is the preferred technique, such an approach was difficult in our case in view of the inability to create a complete seal with the mask. As preoperative telelaryngoscopy and radiological assessment revealed normal airway below the oropharynx [Figure 1]d, we preferred to secure the airway with ProSeal™ LMA after intravenous induction with propofol. Securing the airway with a dedicated supraglottic airway device such as an LMA provides the anaesthesiologist the ability to safely oxygenate the patient even if attempts at tracheal intubation fail. Parmet et al. have reported that LMA provides successful rescue ventilation in 94.1% of patients who cannot be mask ventilated or intubated. Once adequate ventilation is confirmed with ProSeal™ LMA, tracheal intubation can be achieved by various techniques based on the preference of the anaesthesiologist. One option is to use the ProSeal™ LMA as a conduit for fibreoptic bronchoscope-guided intubation, but success depends on the expertise of the anaesthesiologist. Another option is to attempt conventional laryngoscopy after removing ProSeal™ LMA using either Macintosh laryngoscope or a videolaryngoscope. Although there have been reports of successful intubation using Macintosh laryngoscope in patients with gross facial deformity, we anticipated that the mass would obstruct glottic view and interfere with intubation. To overcome this difficulty, we used the C-MAC® videolaryngoscope which has got a camera at the light source and a display which gives a magnified view of the glottis for easy intubation. Videolaryngoscopes are newer generation devices introduced in the difficult airway algorithm by the American Society of Anesthesiologists in 2013 as an adjuvant device in the nonemergent airway management pathway. The Difficult Airway Society also recommends that all anaesthesiologists should be skilled in the use of a videolaryngoscope. Aziz et al. compared the effectiveness of C-MAC® videolaryngoscope with direct laryngoscopy in the setting of the predicted difficult airway and concluded that there is higher success rate for tracheal intubation on the first attempt with C-MAC® videolaryngoscope compared to direct laryngoscopy. Airway algorithms need to be tailored to suit individual cases depending on the availability of resources and experience of the anaesthesiologists. Thus, anticipated difficult mask ventilation can be successfully managed using a ProSeal™ LMA and C-MAC® videolaryngoscope, particularly in paediatric and uncooperative patients. The authors certify that they have obtained all appropriate patient consent forms. In the form, the patient's guardian has given consent for the patient's images and other clinical information to be reported in the journal. They understand that the patient's name and initials will not be published and due efforts will be made to conceal identity, but anonymity cannot be guaranteed. Koerner IP, Brambrink AM. Fiberoptic techniques. Best Pract Res Clin Anaesthesiol 2005;19:611-21. Charters P, O'Sullivan E. The 'dedicated airway': A review of the concept and an update of current practice. Anaesthesia 1999;54:778-86. Parmet JL, Colonna-Romano P, Horrow JC, Miller F, Gonzales J, Rosenberg H, et al. The laryngeal mask airway reliably provides rescue ventilation in cases of unanticipated difficult tracheal intubation along with difficult mask ventilation. Anesth Analg 1998;87:661-5. Cavus E, Kieckhaefer J, Doerges V, Moeller T, Thee C, Wagner K, et al. The C-MAC videolaryngoscope:First experiences with a new device for videolaryngoscopy-guided intubation. Anesth Analg 2010;110:473-7. Frerk C, Mitchell VS, McNarry AF, Mendonca C, Bhagrath R, Patel A, et al. Difficult airway society 2015 guidelines for management of unanticipated difficult intubation in adults. Br J Anaesth 2015;115:827-48. Aziz MF, Dillman D, Fu R, Brambrink AM. Comparative effectiveness of the C-MAC video laryngoscope versus direct laryngoscopy in the setting of the predicted difficult airway. Anesthesiology 2012;116:629-36.